It’s not exactly trade season, but that usually doesn’t stop Seattle Mariners GM Jerry Dipoto from wheeling and dealing. Friday night, Dipoto and the Mariners acquired reliever Alex Colome and outfielder Denard Span from the Tampa Bay Rays. In exchange, the Rays have received pitching prospects Tommy Romero and Andrew Moore. On the surface, this trade appears to be in reaction to the recent suspension of Robinson Cano and injury to Dee Gordon. Seattle is hopeful that Gordon won’t be out too long with a broken toe. When he returns, he should resume filling in for Cano at second base. Span figures to help fill the void left by Gordon in the outfield. 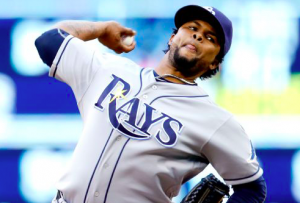 Colome, meanwhile, will help to bolster Seattle’s bullpen, which has been effective this season despite the absence of David Phelps because of Tommy John surgery. Adding Span and Colome will cost Seattle roughly $9 million. But Cano’s suspension will end up saving them $12 million. The 34-year old Span is having a solid but unspectacular season. He’s hitting .234, which is well below his career average. However, is slugging percentage is up, helping give him an OPS of .749. He’s played exclusively in left field this season and should continue to do so with the Mariners. Guillermo Heredia has started to play in center field with Gordon no longer playing there. Adding Span will allow the light-hitting Ben Gamel to serve as Seattle’s fourth outfielder rather than be an everyday player. As for Colome, he was serving as Tampa’s closer this season. Despite a modest 4.35 ERA, Colome has saved 11 games in 13 opportunities. He’s been the primary closer for the Rays each of the past two seasons as well. However, Edwin Diaz is currently entrenched as Seattle’s closer. That will leave Colome to serve as the team’s primary setup man, which will help add depth to Seattle’s bullpen. With the Mariners losing Gordon for the time being and Cano for 80 games, they needed reinforcements. Span won’t move the needle much, but he provides Seattle with a proven major league hitter. If nothing else, he’ll be an upgrade over Gamel. With Colome, they add to an already solid bullpen. Adding both won’t drastically change their roster. But it should help them to keep pace in a competitive AL West with Cano on the sidelines. For the Rays, Friday’s trade continues a fire sale that began last winter when they traded players like Evan Longoria, Steven Souza, and Jake Odorizzi. This trade doesn’t help Tampa get better either this year or in the future, especially since Colome still has two years of arbitration. Without Span, their outfield barely qualifies as a major league outfield. Tampa’s below-average bullpen is now without its closer. Despite being below .500 at the moment, the Rays are not completely out of contention at this point. But this trade indicates they are not inclined to compete for a wild-card spot this year. Both Romero and Moore are having impressive seasons, but neither is considered a major prospect. For the most part, this was another salary dump for the Rays. Meanwhile, the Mariners are hoping this trade helps them secure a playoff birth for the first time since 2001.